The efforts being put into entrepreneurship development in Nigeria is commendable but a lot is still desired. The social enterprise impacts society on a scale far above that of a business that is all out for profit alone. Therefore the need to support ideas and innovation that come from social entrepreneurs, creating an enabling environment for them to thrive and fostering collaboration and continuous dialogue is essential. The target audience are young people with ideas for social innovation, business startups, already existing businesses, executives running social businesses or NGOs who are seeking to reshape or grow their organisations, corporate organisations/public institutions that have interest in CSR projects and need ideas, individuals who wish to explore a new career in social entrepreneurship, policy makers in every sector of the economy, government or philanthropic organisations that might be looking to invest in or buy from Social Enterprise. “I am excited at this opportunity to speak at the APLUS social entrepreneurship conference”, stated Mrs Josephine Nzerem, the Regional Director, Ashoka West Africa Anglophone. “I commend APLUS Trainers for putting together a programme like this at a time when Social Entrepreneurship is being globally promoted and gaining buy-in for socioeconomic development”. She encouraged the education sector to take advantage of this event. “The need to include social entrepreneurship in the curriculum is critical to national development. The Ministry of education, the Nigeria Universities Commission (NUC) and Entrepreneurship development arms of all universities should participate in these three days conference”, she said. A highlight of the event is the Social Innovators pitch, a session where social innovation ideas are presented before a panel of judges and the audience. The top 3 entries will receive 3 months to 1 year of incubation and mentorship support. Interested participants, especially young people are encouraged to apply online. The conference will take place at the Abuja Enterprise Agency conference hall, AEA Entrepreneurial Complex, Plot 74, Zone B15, Jahi, Abuja. 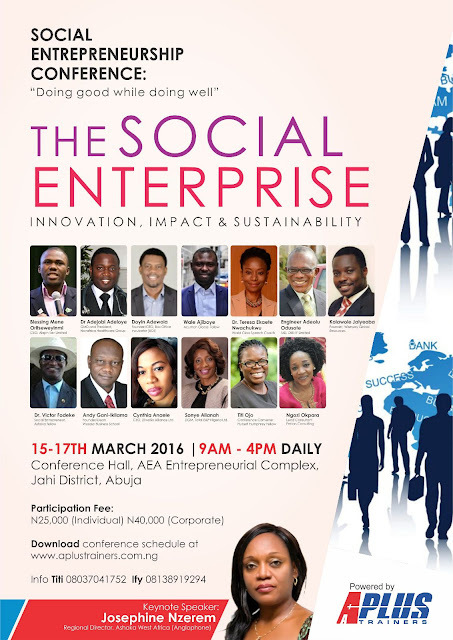 Online registration can be done at www.aplustrainers.com.ng/social-entrepreneurship-conference.